Want to read excerpts and more about the authors? 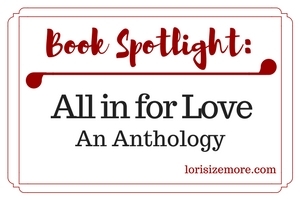 Hey Lori, thanks so much for featuring ALL IN FOR LOVE on your blog. We hope your followers, friends enjoy the stories in the anthology. Thank you for hosting us on your lovely blog, Lori! Keta, Kat, and Sharon — It was my pleasure to have you here! I’ve been traveling all day or I would’ve said hello sooner. Thanks so much for sharing this wonderful new book with my readers. Hi, Lori! I’m tagging behind the others! Thank you so much for hosting us! We appreciate the time and effort it takes to post information like this and are grateful to you for your help. Have a nice weekend! Hi MJ! Thanks so much. It was a pleasure featuring this anthology.